All plans include unlimited users, support and daily backups. Overall: As a Technologist, I review the market for leading Financial Services institutions looking for the very best technology in the market. It's my job to ensure we select best-in-class cloud solutions that combine an intuitive interface within an Enterprise grade, scalable and robust solution. I also need to ensure adherence to rigorous security standards that are demanded by our industry and integration of a chosen solution within the client's ecosystem of applications. 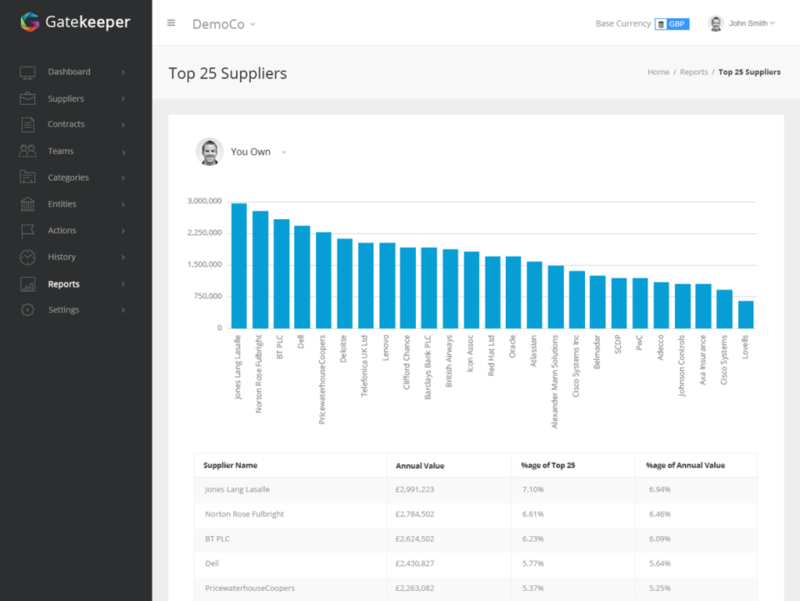 Following a detailed review of the market, shortlisting and formal procurement process, Gatekeeper stood out as the class-leading vendor and contract management solution based on the feature set and flexibility of the application. The current solution available and the overall vision is compelling. We conducted a granular security review including our own penetration testing. It is clear from the output of this process that security is at the very core of the Gatekeeper application. This cannot be underestimated as we all move to the cloud. We worked with Gatekeeper to implement their solution quickly and effectively across the organization. A seamless integration with OneLogin has made provisioning and user access simple and highly effective. User adoption is high and we look forward to expanding the use of the solution to their Portal Technology. The Gatekeeper Customer Success Team and Technical support are, like the solution itself, the highest standard we have found in the industry today. I have no hesitation in strongly recommending Gatekeeper. The software is in a different league when compared to the competition. Pros: Clear, concise, quick and straightforward GUI. High level of user adoption in first use. High level of customization allowed while maintaining a robust core. Mobile interface works as good as normal web interface. A great team of experienced support people who actually listen and act upon suggestions and even implementing them in the final product. There bug fixing capacity is very quick. We have seen some happen in days after noticing them. Some features are: When you send a message via Gatekeeper to a supplier their response will also be captured in the tool including any attachments. That allows for a robust audit trail. 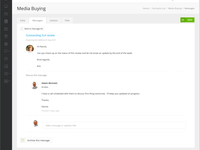 Customizable workflows that allows for delegation of responsibilities within your organization. Cons: It's more costly when compared to competitors but it's also much more product for the money. 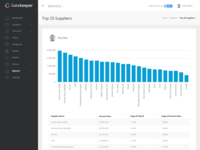 The supplier portal suggested for us not only onboarding of new suppliers but also a supplier maintaining its own compliance data. At the time of writing this is not yet possible. At this moment e-signing and redlining is not yet available. Pros: Ideal system with feature set matches our needs. I like workflow flexibility, access control, bulk upload/update, flexible vendor and contract views, user management and dashboards. Overall, I like intuitive design, it helped our admin and end users to start using without much training. 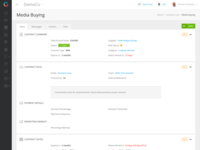 I am also looking for basic spend functionality without a need for buying additional spend module. Cons: I like all the features, but suggest having more flexibility and options to create additional dashboards. Overall: This system helped us maintain all our contractual documentation and vendor contact details in a centralized location. Also we are using this system effectively to track risk based on our audit findings. 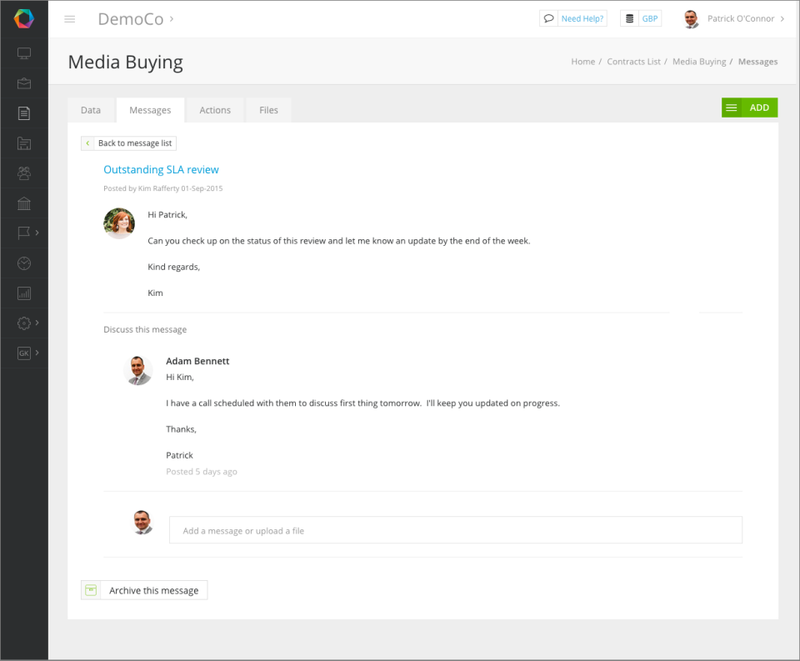 Overall we are able to transform our vendor management by onboarding Gatekeeper system. Comments: As a busy legal team we needed a central area to manage all contracts and give full visibility to the business. Gatekeeper has an extremely easy to use interface requiring little to no training. The customer success team worked very closely with us to configure the solution to meet our exact use-case. 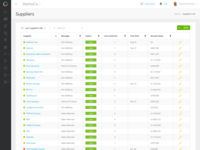 The Google Apps integration and unlimited user plan has allowed Lending Home to roll out Gatekeeper to over 200 users giving direct and controlled access to specific contract records company-wide. Gatekeeper has transformed the way our department engages with the business, improving efficiency, reducing risk and greatly enhancing collaboration. We are delighted with our choice of solution in Gatekeeper. Pros: Getting data into Gatekeeper has been simple and the benefits have far exceeded our original objectives. Our internal owners are now proactively notified when contracts are due for renewals and on other key regular events such as vendor reviews and key documentation updates. 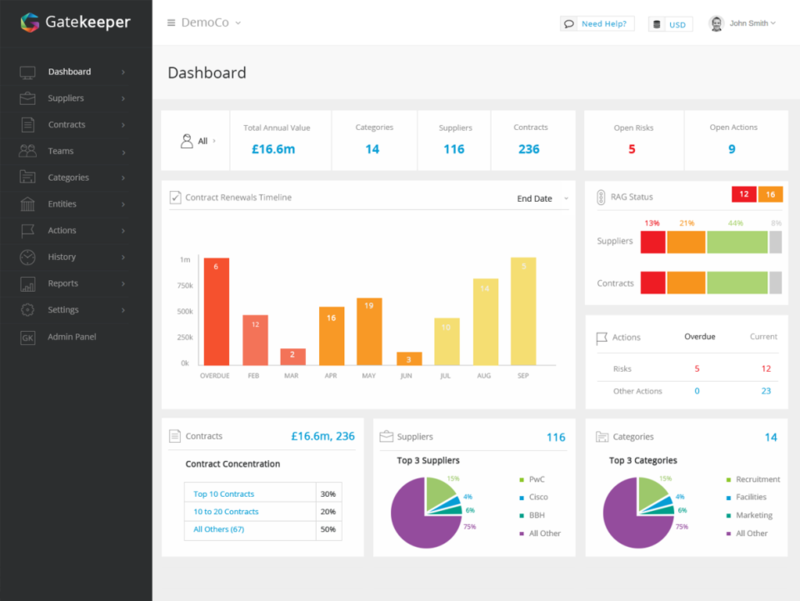 The dashboards in Gatekeeper provide such a clear view of our data so we can be proactive, renewing contracts on better terms and cancelling contracts we do not need well in advance. This all provides an excellent return on our investment. Gatekeeper is simple to use and when some help or guidance is needed, support is always available online in their Live Chat feature. Overall: Greatly enhanced clarity of all of our data. We especially enjoy having full visibility of all upcoming renewals. Comments: We has been looking for a cloud tool to help us manage hundreds of contracts with a range of different key deadlines and end dates. Having used Excel as we grew this started to cause a number of problems. We reviewed the market and either found simplistic solutions that lacked customisation or expensive Enterprise solutions that needed to be tailored costing us more money than we wanted to spend. Pros: Gatekeeper came with almost all of the features at less than 20% of the cost of the bigger vendors. The interface is great and really easy to use. The team just jumped in and got work done. We love the built in email/messaging system. As we deal with many suppliers storing all emails/messages centrally means every member of the team is up to date. This software has saved us lots of management time along with allow us to reduce costs. The support is great and we get updates on enhancements and new features all of the time - some of these were built based on our own requirements without additional costs. Cons: When Gatekeeper first launched there was no Google Drive or Google Apps integration but this has now been added and it make the administration really simple. I wish all the systems we used were like Gatekeeper. Comments: We selected Gatekeeper after spending enough time in the solution to see how easy it was to use compared to other solutions we had demonstrated to us. The team helped us every step of the way to get our vendor and contract data entered and imported. It was very easy to configure the data we needed to store and all of the views to match our exact processes. I was dreading the process of getting our data into any system but doing this in Gatekeeper was painless. Seeing the dashboards and reports come to life and give us the information and email alerts to get on top of our workload was so satisfying. User-friendly, customisable, excellent customer support. Pros: The user interface is very intuitive and the ability to customise allows us to easily integrate with existing processes and engage users in order to maximise the benefits of using the system. The Gatekeeper team have done a great job onboarding and go above and beyond to find effective solutions. The product team are quick to develop smart features in response to our business needs. Cons: There is room for development of the product, in particular eSignature, but we expect to see this in the near future. Comments: We chose to partner with Gatekeeper as their technology was by far the most intuitive we evaluated. Our challenge was to secure accurate master data and compliance information from over 3,500 suppliers across Europe. Comments: The Gatekeeper team is amazing. They are very responsive when there are questions. Very easy to work with; They listen to their customers! Pros: Great having all of my contracts at my fingertips. We are a nonprofit organization with limited budget, but Gatekeeper was very willing to work with us to allow it to fit into our numbers. Staff are very eager to make updates to their system based on customer feedback. We've had a few features added very quickly after we made a request. Program is very user friendly. Cons: We have been using Gatekeeper for just over a year. I have not found anything that I would consider a con. Gatekeeper was get to work with. The team was knowledgeable and prompt. Pros: Very intuitive and easy to use. Requires very little user training and support. Also like the ease in which fields can be added via administration profile. Cons: Roles - need the ability to further restrict functions and visibility based on specific groups or criteria. Pros: Ease of use and the central contract database. Cons: Lack of e-signature tool. Once in place, this would be a fantastic added feature. Overall: Great tool, giving me a complete overview of contracts within the business, giving me the added benefit of strategic planning. Pros: The program has eliminated the need for drawers full of hanging file folders, with a variety of different individuals. GATEKEEPER has allowed us to centralize contracts, and create a workflow that tracks where contracts are in the process. Gatekeeper allows us to capture the necessary data easily, you can renew and cancel contracts. It is a very useful application and quite comfortable to use. Very easy to use and support responses are fast and effective. 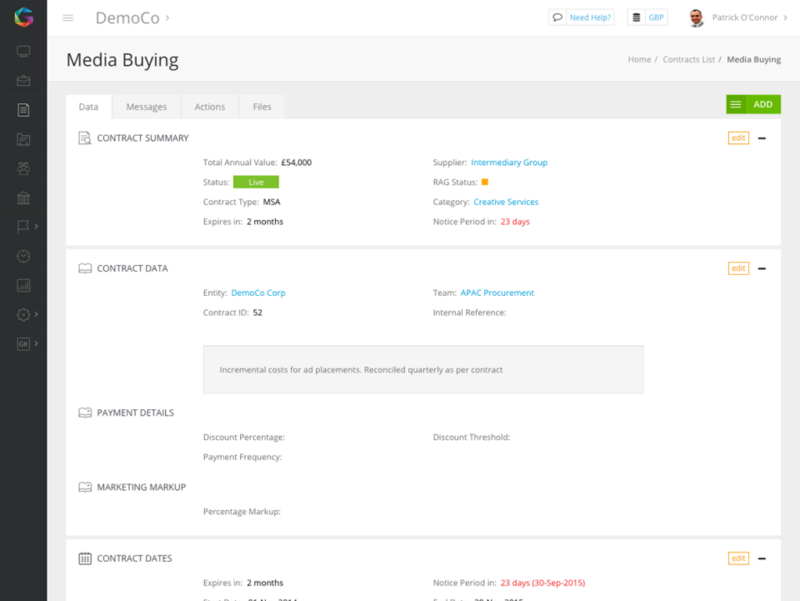 Pros: It allows you to see several important details of the same contracts, such as dates, types of services, billing schedule etc. Pros: Links made between contracts, counterparties, projects, entities. Ease of use. Overall: So happy with the software. Any "cons" surfaced have been addressed in a timely manner and the team is SO helpful and friendly to work with. We love it! Gatekeeper is great and has very good support. Pros: Compared with other solutions, Gatekeeper is very intuitive and simple to use. Also important that support is at a high level. Cons: Compared to similar solutions from the competition - this program is expensive, but working with this product is very efficient. Gatekeeper is an excellent Supplier and Contract management solution with great support. suppliers every day. The interface is beautiful and extremely easy to use - no training required. There are a whole range of options to customise the application and views to our exact needs. The Gatekeeper support team are very responsive to any request, proactively keep us updated on new development and also involve us in the overall product roadmap - its a true partner model. I would thoroughly recommend Gatekeeper and the team to any company wanting to get their suppliers and contracts under control. 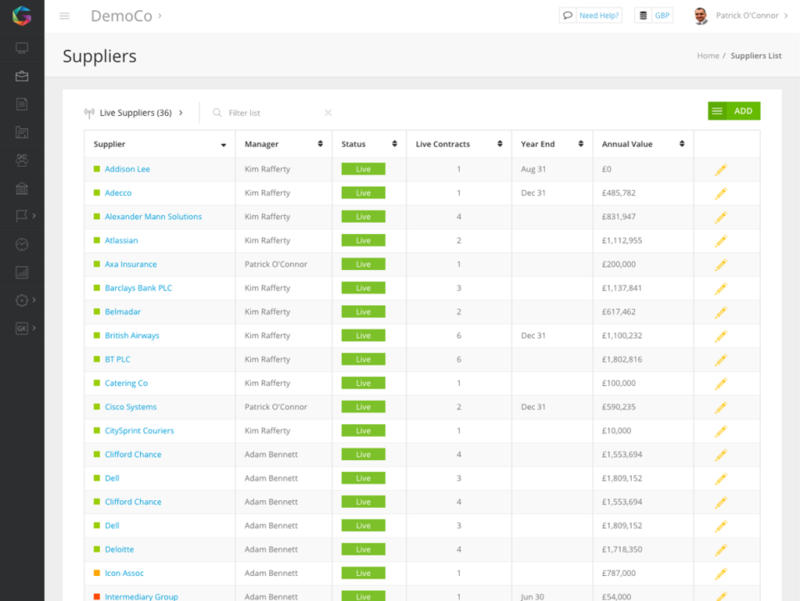 Pros: I think Gatekeeper is a great tool for tracking cash flow and expiration dates of contracts. Very easy to use! Cons: It does have limited functionality. For example, we use the event feature but the fact that an email is sent out at event creation and also when the event is due, it is causing confusion to our end users. Pros: 1. Visualise all Company Processes. 2. Take the `Entry out of Data. 3. Gatekeepers stores interactions is great. Cons: The implementations It takes a Little bit long, specially when your talking to a big company. But ingeneral It is a good software. Pros: I have used Gatekeeper in the past for many years and was satisfied with its performance. It did the job that I wanted! Cons: I have no complaints in regards to Gatekeeper's performance. The support staff was great and the service was great as well.